Let's Do It for ME! : Hurst Family Fundraising for ME! Hurst Family Fundraising for ME! I have suffered with this horrible illness – ME – for over 16 years. I also have Dysautonomia, and was recently diagnosed with Elhers Danlos Syndrome. I have too many symptoms to list, most of them invisible, but the symptoms that cause me most distress are the severe chronic pain and the disabling and very uncomfortable circulatory/cardio vascular problems. I spent the first 2-3 years of the illness completely bed-ridden & all of the past 16 years housebound (mostly bed-ridden) but due to the pain I experience now I am unable to lie down and sitting down is too painful a lot of the time, so life is extremely difficult, having to stand hunched over my bed for hours each day even though this causes me to feel very faint & exhausted. I try to be positive but if I’m honest most days are nothing short of an endurance. This is also the case for many of my fellow Severe ME/EDS sufferers. Back in 2004 I put together some Nature photocards to raise money for various ME Charities. All photos I use for the the cards are taken by either people with ME or the families of PWME. We got 20 packs of each design printed up and thankfully they sold! And incredibly they still do sell! Profits from the photocards go to Invest In ME and The 25% M.E. Group. Alongside the photocards I’ve been making my own greeting cards since 2005. Due to the illness I can usually manage two 20 minute card-making sessions a day and even during these better hours it’s often frustratingly difficult to concentrate due to the pain and vertigo I experience, this is one of the reasons I keep my designs pretty simple, plus I’m not talented enough to create anything too complex! My family have been brilliant and organise sales three times a year at our local supermarkets and our local Farm Shop sell my Easter and Christmas cards. We all just want to do our bit to help raise awareness and funds for this horrible horrible illness that unfortunately can and does destroy lives. Over the past 13 years the cards and the quizzes have raised over £11,000 (£2000 of this was raised by the online quizzes Geoff Allen and I organised). Hopefully the cards will continue selling and hopefully Geoff and I can think of some more quiz questions so we can launch a 2014 Trivia/Picture Quiz later this year! Thanks for reading :-) Jane Hurst. 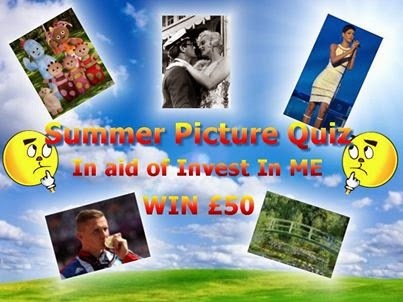 Invest in ME Research charity in developing a UK centre of excellence for ME. Jane has two sets of photocards now with new designs. Click below for details. Cards for all seasons to Invest in ME all year round! Welcome to IIME September Newsletter! From ME to You, With Love - new website launched!